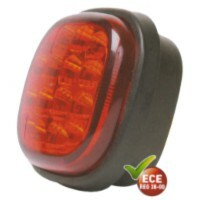 Dual voltage 12 - 24 volt LED fog lamp, red lens. Front or rear, approved for vertical and horizontal mounting, rubber body. Conforms to relevant ECE regulations, IP67 rated.